March 2019. Mike Inkpen's paper on gold-thiol bonds is published in Nature Chemistry and highlighted in Nature Review Materials. November 2018. Giacomo paper in collaboration with Profs. Cvetko, Morgante and Roy on carbene-gold interactions is published in Chemical Science. November 2018. 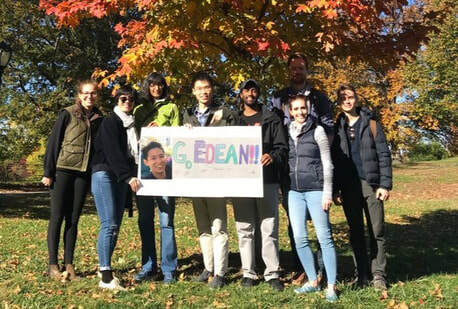 E-Dean runs the NYC marathon and we all cheer him on. October 2018. Yaping's paper, in collaboration with Prof. Gemma Solomon and Prof. Satish Patil's group, on Diketopyrrolopyrrole is published in JACS. September 2018. Suman's paper on the conductance of polymethine molecular wires in collaboration with Prof. Evers and Prof. Marder is published in Nano Letters. June 2018. Our work on creating a single-molecule insulator based on destructive sigma-interference, in collaboration with the Solomon, Nuckolls and Xiao groups is published in Nature. May 2018. Mike Inkpen accepts a faculty position in the Department of Chemistry at USC. Congratulations! April 2018. Congratulations to Suman and Tianren on passing their 2nd year defense! March 2018. We organize, with Mike Inkpen and Gemma Solomon, a symposium at ACS in New Orleans on 'Chemistry of Molecular Electronics'. January 2018. Our work probing charge transport in peptides is published in J.P.C.Lett. December 2017. 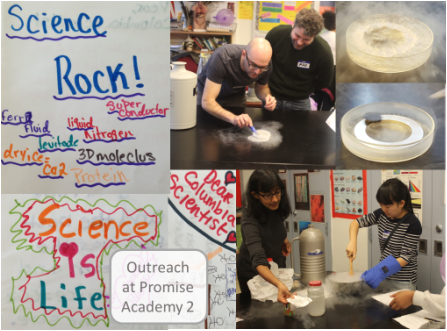 We spend the morning at Promise Academy 2 showing their seventh graders some fun science experiments with members from the Campos and Fernandez groups. October 2017. Our paper demonstrating a highly transparent Au-N bond, in collaboration with Roy group was published in JACS. October 2017. Our paper on creating an antiaromatic single molecule switch, collaboration with the Campos and Neaton groups was published in Science Advances. August 2017. Our paper in collaboration with the Roy group was published in Nature Nanotechnology and featured in IEEE Spectrum. July 2017. We show that Siloxanes make great insulators in a new work published in JACS in collaboration with the Nuckolls and Solomon groups. This was featured in Chemistry World and Scientific American. April 2017. Congratulations to Haixing on successfully defending her thesis! March 2017. Suman receives NSF Graduate Research Fellowship!! Congratulations. February 2017. E-Dean's paper on probing the impact of light on molecular junctions published in Nano Letters. January 2017. Congratulations to Haixing Li on receiving the Iris Ovshinsky Student Travel Award from APS. January 2017. Our work on creating a single-molecule diode is featured in C&EN and in ACS Central Science. January 2017. Haixing's paper in collaboration with the Nuckolls and Leighton groups is published in JACS and also featured as a cover. August 2016. Haixing's paper on the conductance of cyclic pentasilanes is published in Chemical Science. June 2016. Brian's paper on mapping the transmission function in single-molecule junctions is published in Nano Letters. May 2016. Brian Capozzi shares the 2016 Simon Prize awarded to the graduate student of the Department of Applied Physics and Applied Mathematics who has completed the most outstanding dissertation. Congratulations Brian! ​March 2016. Our review for Accounts of Chemical Research with Mark Hybertsen is published. February 2016. Tim Su's review on the chemical principles of single-molecule electronics is published in Nature Reviews Materials. January 2016. Bonnie & Brian's paper on measuring the conductance of atomically precise molecular nano clusters is published in Chemical Science starting a new collaboration with the Roy Group. December 2015. We spend the morning at Promise Academy 2 showing their seventh graders some fun science experiments with members from the Campos and Fernandez groups. ​December 2015. Olgun Adak's paper on measuring charge transfer dynamics across dissimilar interfaces using x-ray spectroscopy techniques, in collaboration with the Cvetko and Morgante groups is published in Nano Letters. October 2015. Congratulations to Olgun for successfully defending his thesis. September 2015. Tim and Haixing's paper on conductance through Germanes, in collaboration with the Nuckolls' group is published in JACS. June 2015. Olgun Adak's two papers are published in Nano Letters. The first is on noise measurements in molecular junctions in collaboration with Mark Hybertsen. The second on the impact of the electrode density of states on single-molecule junction conductance in collaboration with Ferdinand Evers' group. June 2015. Our paper on creating a single-molecule diode is highlighted in Chemical & Engineering News. May 2015. Our paper on creating a single-molecule diode with high on/off ratios in collaboration with the Campos and Neaton groups is published online in Nature Nanotechnology and featured as a News & Views. May 2015 Congratulations to Brian Capozzi on successfully defending his thesis. Apr. 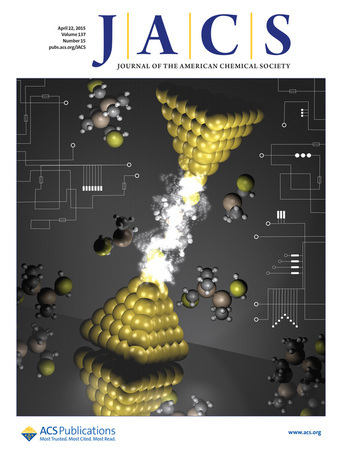 2015 Haixing's paper in collaboration with the Nuckolls group is featured on the cover of JACS and as a spotlight. Feb. 2015 Two papers in collaboration with Profs. Campos and Nuckolls are published back to back in Nature Chemistry and featured in an editorial. Feb. 2015 Congratulations to Emma Dell on successfully defending her thesis. Jan. 2015 Congratulations to Brian Capozzi on receiving the Iris Ovshinsky Student Travel Award from APS. May. 2014 Congratulations to Arunabh Batra on successfully defending his thesis. May. 2014 Sriharsha Aradhya receives "Simon Prize" for the most outstanding dissertation. Congratulations! Apr. 2014 "Breakdown of Interference Rules in Azulene, a Non-Alternant Hydrocarbon" in collaboration with Profs. Campos and Solomon is published in Nano Letters and featured in Nanotechweb.org. Mar. 2014 "Tunable Charge Transport in Single-Molecule Junctions via Electrolytic Gating" is published in Nano Letters and featured in Nanotechweb.org. Feb. 2014 "Evaluating Atomic Components in Molecular Circuits", in collaboration with Prof. Nuckolls is published in Chemical Science. Jan. 2014 "Determination of Energy Level Alignment and Coupling Strength in 4,4'-Bipyridine Single-Molecule Junctions", in collaboration with Prof. Neaton is published in Nano Letters. Jan. 2014 "Aromaticity Decreases Single-Molecule Junction Conductance", in collaboration with Prof. Breslow is published in JACS. Dec. 2013 "Transport properties of individual C60-molecules", in collaboration with Prof. Evers is published in J. Chem. Phys. Nov. 2013 "Tuning Rectification in Single-Molecular Diodes", in collaboration with Profs. Nuckolls and Neaton is published in Nano Letters and featured in Nanotechweb.org. Nov. 2013 "Silicon Ring Strain Creates High-Conductance Pathways in Single-Molecule Circuits", in collaboration with Profs. Nuckolls, Leighton and Steigerwald is published in JACS. Aug. 2013 "Impact of Molecular Symmetry on Single-Molecule Conductance", in collaboration with Prof. Campos is published in JACS. July 2013 "Ultrafast Charge Transfer Through Non-Covalent Au-N Interactions in Molecular Systems", in collaboration with Prof. Morgante and Cvetko is published in J. Phys. Chem. C.
July 2013 "Conductance of Molecular Junctions Formed with Silver Electrodes", in collaboration with Dr. Hybertsen is published in Nano Letters. Jun. 2013 Congratulations to Sriharsha Aradhya on successfully defending his thesis. May 2013 "Length-­‐Dependent Thermopower of Highly Conducting Au-­‐C Bonded Single Molecule Junctions", in collaboration with Dr. Hybertsen is published in Nano Letters. May 2013 Congratulations to Jon Widawsky on successfully defending his thesis. Apr. 2013 Congratulations to Sriharsha Aradhya for winning the "MRS Graduate Student Gold Award". Mar. 2013 "Correlating Structure, Conductance and Mechanics of Silver Atomic-Scale Contacts", in collaboration with Prof. Halbritter is published in ACS Nano. Dec. 2012 "The Importance of Direct Metal-π Coupling in Electronic Transport Through Conjugated Single-molecule Junctions", in collaboration with Prof. Nuckolls is published in J. Am. Chem. Soc. Dec. 2012 "Quantitative Current-Voltage Characteristics in Molecular Junctions from First Principles", in collaboration with Dr. Neaton's group is published in Nano Letters. Nov. 2012 "Quantum Soldering of Individual Quantum Dots", in collaboration with Prof. Nuckolls and Dr. Michael Steigerwald is published in Angewandte Chemie. Oct. 2012 "Probing the Conductance Superposition Law in Single-Molecule Circuits with Parallel Paths", in collaboration with Prof. Breslow and Dr. Mark Hybertsen is published in Nature Nanotechnology along with a News & Views article. Sep. 2012 "Quantifying Through-Space Charge Transfer Dynamics in π-Coupled Molecular Systems", in collaboration with Profs. Cvetko and Morgante is published in Nature Communications. Aug. 2012 "Van der Waals Interactions in Metal-Organic Interfaces at the Single-Molecule Level", in collaboration with Dr. Mark Hybertsen is published in Nature Materials along with a News & Views article and featured on the Columbia SEAS web page. July. 2012 "Electronic Transport and Mechanical Stability of Carboxyl Linked Single-Molecule Junctions", in collaboration with Colin Nuckolls group is published in Phy. Chem. Chem. Phys. Jun. 2012 Sriharsha Aradhya receives "Best Student Paper Award" at the SEM Conference in Costa Mesa, California. Congratulations! Mar. 2012 "Correlation Analysis of Atomic and Single-Molecule Junction Conductance", in collaboration with Prof. Halbritter's group is published in ACS Nano. Feb. 2012 "Dissecting Contact Mechanics from Quantum Interference in Single-Molecule Junctions of Stilbene Derivatives", in collaboration with Prof. Nuckoll's group is published in Nano Letters. Feb. 2012 "Conductive Molecular Silicon" in collaboration with Prof. Nuckoll's group is published in the J. Am. Chem. Soc. Jan. 2012 "Linker Dependent Bond Rupture Force Measurements in Single-Molecule Junctions" in collaboration with Dr. Hybertsen is published in the J. Am. Chem. Soc. Jan. 2012 Congratulations to Masha Kamenetska on successfully defending her thesis with distinction. Dec. 2011 Congratulations to Michael Frei on successfully defending his thesis. Dec. 2011 We measure the thermopower of single molecule junctions for both HOMO and LUMO conducting molecules and compare these to DFT based calculations. This work, in collaboration with Dr. Neaton's group is published in Nano Letters. Oct. 2011 Our work showing that we can achieve close to 1G0 in a single molecule junction in collaboration with Prof. Breslow's group and with Dr. Hybertsen is published in JACS and featured in the October 17 issue of C&EN. Jun. 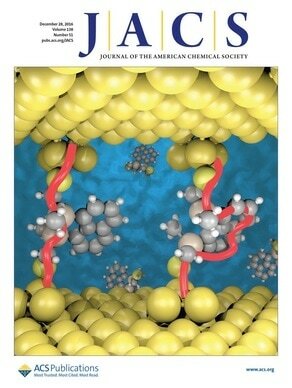 2011 Our work on probing Tetramethyl benzenediamine on an Au(111) surface was published in J. Phys. Chem. C. This was in collaboration with Prof. Morgante's group and was partly carried out at the Center for Functional Nanomaterials (BNL). Jun. 2011 Our work demonstrating in situ formation of highly conducting covalent Au–C contacts in single molecule junctions in collaboration with Prof. Brelow's group and with Dr. Hybertsen is published in Nature Nanotechnology. Jun. 2011. Our work demonstrating the synthesis and measurement of transport through single inorganic molecular clusters, in collaboration with Dr. Steigerwald and Prof. Nuckoll's group is published in JACS. May. 2011 Our work demonstrating that single molecule conductance can be modulated by solvents, in collaboration with Jeff Neaton is published in Nano Letters. Apr. 2011 Our work demonstrating a single molecule potentiometer in collaboration with Colin Nuckoll's group was published in Nano Letters and featured in the April issue of C&EN. Mar. 2011 Our work correlating single bond rupture forces with molecular backbone chemistry, in collaboration with Mark Hybertsen, is published in Nano Letters. Feb. 2011 Our work on the conductance of pi-stacked molecules in collaboration with Prof. Breslow's group is published the J. Am. Chem. Soc. and on the cover. Dec. 2010 Our lab moves to the new North-West Corner Building of Columbia University's main campus. Aug. 2010 Our work on the conductance of biphenylenes in collaboration with Prof. Breslow's group is published the Organic Letters. Jun. 2010 Our work probing energy level alignment of amine-linked molecules on Au substrates, in collaboration with Jeff Neaton's and Alberto Morgante's groups is published in Nano Letters. Jun. 2010 Our work on the conductance of diphenylphosphine linked molecules in collaboration with Colin Nuckolls' and Mark Hybertsen's group is published in J. Phys. Chem. Letters. May 2010 Our work on the conductance of pyriding terminated molecules in collaboration with Jeff Neaton's group is published in J. Am. Chem. Soc. Apr. 2010 Congratulations to Arun on receiving an NSF Graduate Research Fellowship. Jan. 2010 Congratulations to Eek on receiving the Rubicon Post-Doctoral Fellowship. Oct. 2009 We present a technique to measure statistically significant I-Vs on single molecule junctions. This work will appear in special issue of Nanotechnology this fall. Jul. 2009 Our work on the effect of molecular rotations on conductance, in collaboration with Colin Nuckolls' and Mark Hybertsen's groups is published in JACS. Mar. 2009 Our work on single molecule junction formation and evolution, in collaboration with Mark Hybertsen's group is published in Physical Review Letters.